Home » General » Moon Valley Organics Giveaway! A few months ago, I found myself wandering the isles of the Woolley Market after winning one of those Cascade Loop Scavenger hunt giveaways. It was a rainy day, my husband was working late and the kids and I thought “what the heck, we’ll just go out and try to find the giftcard.” So glad we did, because it didn’t take long for our 7 year old to spot it in downtown Sedro Woolley! The kids and I loved shopping the market (a totally cool natural food/deli/local products store that you must check out, if you haven’t). Anyway- as we walked the isles, I came across some organic lotion bars from Moon Valley Organics. I was intrigued because for one, they smell amazing and for two, they are made locally, in Deming WA. I bought the lotion bar and I’ve been in love with Moon Valley products ever since. 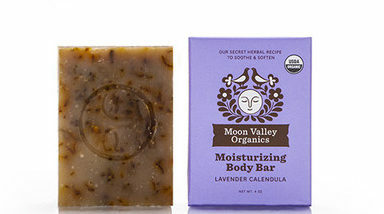 Moon Valley Organics is not only committed to making superb organic skincare products, they are also dedicated to sustainable farming practices with little environmental impact such as a greywater system for production department waste, rainwater catchment for crop watering, composting, and recycling. Moon Valley Organics uses 100% USDA certified organic, sustainably farmed herbs using permaculture practices. They are carefully dried, processed and packaged on site. What they can’t grow, they source from local organic farms and suppliers who support fair trade practices. Moon Valley products are sold all over and you can easily find them at a store near you with their store locator. Today, to make your Monday a little sweeter, we’ve partnered with Moon Valley for a really great giveaway! If you or someone you love appreciates organic, local, wonderfully smelling skincare, you are going to LOVE this. These products are perfect for those of us with sensitive skin, since they are free of dyes and chemicals. I’ve personally had the pleasure of learning more about this farm and working with their employees on this giveaway has been so much fun. These people are the real deal. They care about this area, they are kind and they are really good at what they do. 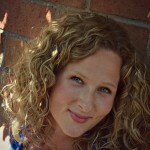 Moon Valley has offered to give TWO NW Healthy Mama Readers a Skin Essentials Set. 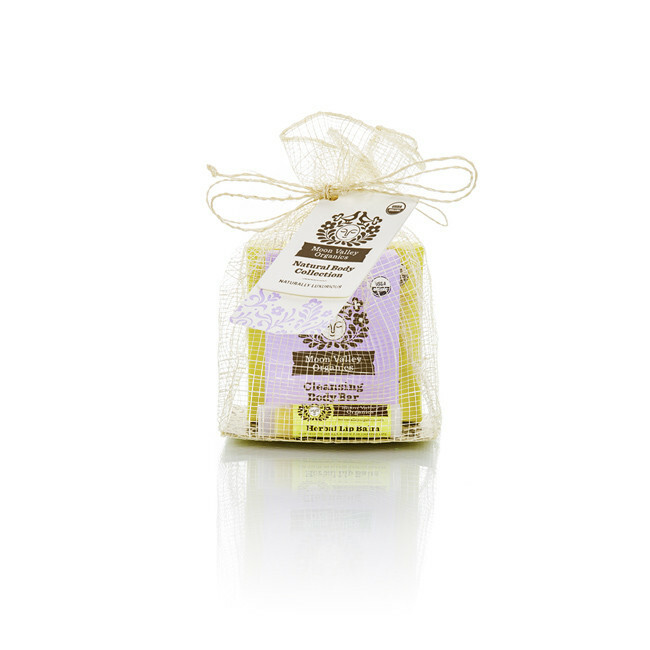 This set includes their lotion bar, a soap bar and an herbal lip balm. Best of luck! Looks like an awesome company! I’m looking forward to having my baby this summer! Baby boy #4, due in July!! I’m looking forward to more camping trips with my baby girl! So fun! Where do you enjoy camping? My husband and I love your blog! We especially like your reviews of hikes. We are both in our sixties and look for hikes that are no more than moderate difficulty. Last Wednesday, we hiked Wallace Falls in Gold Bar. We hit our limit but loved the falls and serenity of the trail. Keep up the good work. God bless you and your beautiful family. Lydia- this is so encouraging to me! More hikes for you to enjoy will be posted so keep on reading! Thank you for the sweet comment! Happy hiking! I’m looking forward to going to the splash pad with my son! I am looking forward to taking my toddlers on their first real camping adventure (not just the backyard). Looking forward to my daughter returning from 9 months of overseas study, and having lots of hiking and backpacking adventures with her. This brand sounds great! I’ve never heard of them before, but I love what they stand for. Those Moon Valley Organics are the best!!! I love the display of lip balm. This is a great post. Nice to meet you by the way! i am looking forward to some family vacations. I love local, organic brands! Thanks for sharing this! I am looking forward to going for a nice sail with my brother this summer. im really looking forward too all of our fresh veggies from our garden! I’m looking forward to my trip to Chicago, which will be later this summer. I’m looking forward to visiting my parents. I’m looking forward to my friends 4th of July party at their lake house. My boyfriend’s roommate uses Moon Valley hand soap in his bathroom. I didn’t realize they sold other products. Thanks!